For the latest info on QUC, please join our mailing list. Just put 'subscribe' in the subject line. We won't spam you, share or sell your info - ever. Noise pollution is steadily increasing throughout our environment. Places of quiet are becoming more and more difficult to find in Colorado or throughout our country. Most Americans live in urban areas -- places which are far from silent. Leaving urban areas to find peace and quiet can be difficult and time-consuming and often requires traveling over long distances. Even the modes of travel used to get away from the din of urban areas can be noisy as well. Highway traffic, commercial airlines, small planes, and trains all operate within environments having relatively high noise levels. We know that most people visit our public lands to find peace, solitude and freedom from the frustrations and distractions of modern society. The vast majority of public land visitors specifically want to experience natural sights, sounds and smells during their visit. These are quiet users: people and life forms that seek out and depend on natural areas on public lands to hike, fish, relax, view nature and wildlife, escape the hustle of civilization, camp, bicycle, paddle, etc. 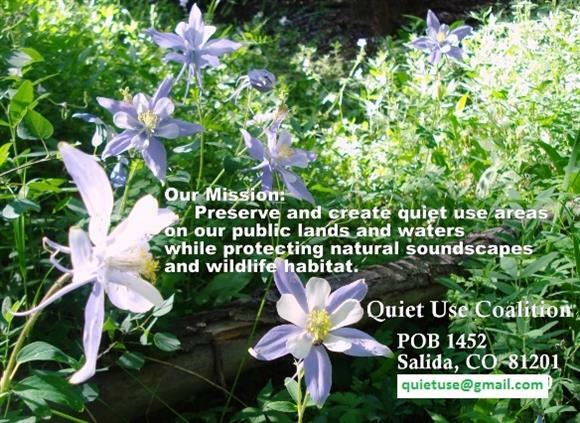 We are a non-profit environmental organization working to preserve and create quiet use areas on public lands and waters, while protecting natural soundscapes and wildlife habitat. The public lands and waters sought out to escape civilization; natural and undeveloped open spaces, forests and wilderness areas, have been recently invaded by an explosive growth of personal motorized recreational vehicles (PMRVs). The negative impacts of these machines take many forms; including pulverization or compaction of plants and soil, soil erosion, weed dispersal, stream siltation, disturbance of wildlife, fragmentation of habitat, exhaust emissions, increased fire risk, increased road and trail maintenance, and the endangerment of other human users with excessive speed. But it is the noise generated by these machines that has come to symbolize all of the negative effects they produce and it is that impact which has rallied citizens to form the Quiet Use Coalition.